Award Winning Design! The addition of this Nejad-designed Oriental rug perfectly complements the open airiness and rich golden hues of this Newtown PA sunroom. 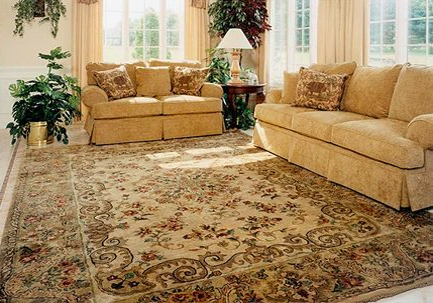 upholstery fabric on the sofa and love seat was carefully selected to coordinate with the rug’s main beige gold color. The throw pillows feature contrasting fabric and trim repeating the rug’s color palette and the large potted plants are very similar to the green hues in the rug. Toll Brothers is an award winning Fortune 1000 company based in Horsham, PA which builds luxury homes across the United States. Started in 1967, Toll Brothers was recently named national Builder of the Year by BUILDER magazine and was twice named national Builder of the Year by Professional Builder magazine. Nejad Rugs is an award winning Oriental Rug Designer, Manufacturer and Importer of fine handmade rugs since 1985 and is based in Doylestown Bucks County, PA with a showroom at 1 N. Main Street and two Pennsylvania warehouses. Nejad Rugs is the premiere source for beautiful decorative new and antique Oriental rugs, shipping rugs across the United States and internationally.